Presenting potential theories to explain the Big Ten's freshman ineligibility push. Plus, more college football analysis in Punt, Pass & Pork. One question from last week’s #DearAndy mailbag keeps gnawing at me, possibly because there is no satisfactory answer at the moment. Louisville radio host Mark Ennis asked what ulterior motive Big Ten commissioner Jim Delany might have in pushing the idea of freshman ineligibility—a concept that died in 1972—for football and men’s basketball players. 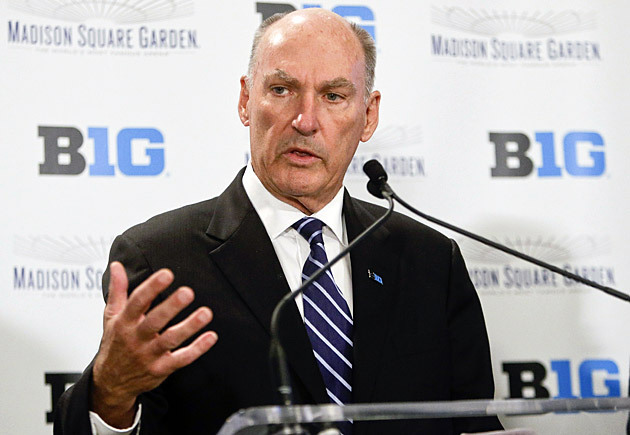 Delany and the Big Ten have churched up the name a bit, calling it a “Year of Readiness,” but the notion remains the same. Freshmen, or “first-years” at Virginia, wouldn’t be allowed to play in games. The Big Ten intends to distribute a white paper discussing the issue to various “thought leaders,” but the gist of the Big Ten’s release from last week is that this won’t happen unless it passes through the legislative process. No league wants to voluntarily put itself at a competitive disadvantage, so why would the Big Ten push this plan now? And why would the Big 12 and Pac-12 commissioners seem at least interested, if not in favor of it? After speaking to a few Thought Leaders, I have some theories. Delany has said all of this before. I watched him say it under oath in a federal courtroom in Oakland, Calif., last June. During his testimony in O’Bannon v. NCAA, Delany referred to freshman ineligibility as a potential “silver bullet” that could help ill-prepared athletes adjust to the rigors of collegiate coursework. The idea fit neatly into the rest of Delany’s testimony, which generally expressed a desire for college athletes to be treated more like regular students who happen to play sports instead of athletes who occasionally happen to attend class. I believe Delany was telling the truth because he was an NCAA witness and his testimony helped sink the NCAA’s already weak case. (Also, because he has made similar statements elsewhere, and has not deviated from the general theme.) The NCAA had spent most of the trial trying to explain that a plaintiffs’ victory would drive a wedge between athletes and the general student body. Delany reinforced what the plaintiffs’ attorneys had argued for the entire trial; the wedge has existed for years. Delany didn’t mean to hurt the NCAA’s case. He was simply being honest, and honesty didn’t mesh with the fantasy world the NCAA’s attorneys wanted Judge Claudia Wilken to believe existed. Freshmen were ineligible when Delany arrived as a basketball player at North Carolina in 1966. In Delany’s ideal college athletic model, everything would be as it was when he played for the Tar Heels—except the increases in revenue will fund even more scholarships in more sports. His statements through the years have hammered home the point that his experience as a student and an athlete helped shape him into the ultra-successful man he became. It’s also clear Delany wants as many people as possible to have an identical experience with the hope that it might help them find success in their adult lives. Ascribe all the ulterior motives you’d like, but I believe this is Delany’s primary motivation for just about everything he does. It may be make for snappier columns to envision Delany as a cartoon supervillain sitting in suburban Chicago trying to squeeze another dollar out of the efforts of Ohio State’s quarterbacks. But that isn’t the truth. Unfortunately for Delany, reality has shifted since 1966. Back then, college sports were a business but not a multibillion-dollar business. Coaches, athletic directors and conference commissioners in the most powerful leagues made decent enough wages by the standard of the day, but nowhere near the megabucks they make now. No commissioner would have envisioned that he’d be the de facto head of a cable television network. But that’s what Delany is now. He has made millions off college athletics. He created the Big Ten Network. He will be the one watching as ESPN and FOX trip over one another to throw money at the Big Ten when its first-tier media rights become available next year. In fact, it’s easy to argue no one is more responsible for turning college sports into the cutthroat business it is today than Delany. It also doesn’t help that Delany and his fellow commissioners needed a host of federal lawsuits to convince them to give the football and basketball players whose efforts produce all of the money their first raise—if you can call the cost-of-attendance stipends coming down the pipe a raise—since the 1940s. When an administrator suggests anything that appears to take something away from the athletes upon whom the business is built, he will be accused of having ulterior motives. There is no doubt that the people in charge of college sports want an antitrust exemption. The NCAA has jacked up its lobbying budget, and individual leagues have tried to increase their influence in Washington as well. These people need an antitrust exemption so various schools and conferences can continue to collude to impose what amounts to a wage ceiling on the bulk of their labor force. One problem they face is that even the politicians who lean their way might be wary of giving an exemption to a group that claims to be about education but makes every major decision with an eye toward revenue generation. Freshman ineligibility would not make money for the schools. It would cost money. It likely wouldn’t devalue the football product, but it could reduce men’s basketball revenue. As long as the NBA maintains its current age limit, freshman ineligibility would chase most potential NBA lottery picks from the college game. Such players only come to college for a year now, but their presence gives basketball fans eager to watch the game’s next set of stars a reason to watch. Without those players, fans could stop paying attention. (At least until the NCAA tournament, when the ease of gambling on the event protects its popularity.) If those fans stop watching, ESPN and FOX might not pay as much for games in the next round of rights deals. This isn’t a huge sum compared to what a disruption in the flow of football talent would cause, but it could result in a real loss of revenue. It means the people who run college sports would have made a decision that put education above revenue. Such a move could help convince legislators to get behind an antitrust exemption. John Calipari has figured out how to make Kentucky basketball dominant with a constant stream of one-and-done players. Make freshmen ineligible and Calipari would have to completely alter his recruiting philosophy. That wouldn’t guarantee a drop-off for Kentucky—after all, Calipari won at UMass and Memphis without so many one-and-dones—but it would force the Wildcats to adjust and keep the SEC from penciling a team into the Final Four almost every season. In football, the rule would allow teams in other leagues time to develop their young players. This might help negate the SEC’s homegrown talent advantage by only allowing the Alabamas and LSUs of the world to get two years on the field from the nearby talent they scoop up so easily every February. I’m most skeptical of this theory, mostly because there are plenty of ACC, Big 12 and Pac-12 schools with easy access to talent. Plus, the Ohio State team that just won the national title looked and played exactly like the best SEC programs of the past decade. You’ll never guess which conference the Thought Leaders who came up with this theory work inside. Maybe Delany and the others want to hedge their bets in case the NCAA and the conferences don’t get their antitrust exemption and get crushed in federal court over the next decade. If upheld on appeal, the verdict in the O’Bannon case will allow for more money for athletes, but only on a limited basis. O’Bannon only applies to the group sale of name, image and likeness rights. The NCAA’s rules against individual athletes cashing in have yet to get challenged in this round of lawsuits. That day is coming, though. Jenkins v. NCAA, filed by attorney Jeffrey Kessler, seeks to blow up the entire NCAA rulebook. If that case ultimately succeeds, it would radically alter the business model for major college sports. If anyone were allowed to cut a deal with a player for an endorsement, boosters would try to load up the most sought-after recruits. Schools might promise prospects a certain cut of jersey or autograph sales. “We would create a false market,” one AD always tells me of this scenario. Essentially, this AD guarantees schools and boosters would overpay for talent. (Given what we’ve seen these people pay coaches, this is probably correct.) Perhaps the gap year between high school and playing eligibility would quell the urge to pay an unproven 17-year-old and allow schools and boosters to make better decisions with their money. As you’ve probably already guessed, these theories are ordered by plausibility. It’s highly unlikely that Delany considered for even a second that a buffer year could save people paying players from themselves when he decided the Big Ten should pursue the idea of ineligible freshmen. None of these theories may matter, however, because freshman ineligibility is going to be a tough sell. The idea is that players would have fewer responsibilities as freshmen and would have more time to acclimate to college life and college classes. The most pie-in-the-sky model would severely limit the amount of time the athletic programs could require of their freshmen. Yet the truth is no matter what the rules say coaches would still force players to do everything except play in the games. So, realistically, the players would miss out on the most fun part of being an athlete and only get a few hours back in return. That’s hardly a fair trade. Plus, most coaches would want to field freshman teams that would then play one another. That’s what happened before 1972, and it would probably happen again. Also, the Big Ten plan would land on top of a new NCAA policy set to take effect in 2016 that will force athletes to redshirt if they don’t meet certain academic benchmarks coming out of high school. This policy essentially brings back the old partial qualifier designation. So, if the least ready of the athletes already must redshirt, why punish the ones who do arrive to college prepared? Meanwhile, football coaches would want more scholarships available because they would have less roster depth. “They want us to play all these games with 60 scholarship players?” TCU coach Gary Patterson said to FOX Sports’ David Ubben last week. “I'll take it with 10 more scholarships, but you can't talk out of both sides of your mouth.” The inevitable increase in scholarships would cost more money. Of course, it would also provide more scholarship opportunities to athletes, so that could be a good byproduct. Yet it would require another choice that puts education above money. And these scholarships would cost more than they did in the past. They would be for the full cost of attendance, and might also include a name, image and likeness stipend. Plus, in a day and age when law schools are designing tracks seemingly dedicated to suing the NCAA, would it be wise to only make football and men’s basketball players ineligible as freshmen? Wouldn’t that be begging for a gender discrimination lawsuit, at least from the basketball side? But Oklahoma athletic director Joe Castiglione makes an excellent point. Despite those reasons listed above—and Castiglione has considered most, if not all—this conversation is ultimately about seeking a way to help athletes become better students. Even if it doesn’t result in freshman ineligibility, it could generate an idea or two that help make progress toward that goal. “No matter the individual opinions on the topic, it’s a healthy discussion to have,” Castiglione said. “And it probably shouldn’t stop at just that one issue.” This is a time of sweeping change in college sports. Why not put everything on the table? Mississippi State AD Scott Stricklin said taking away playing opportunities might be a bad look in an age when college sports administrators are finally building goodwill by providing more money and resources to athletes. He suggests a compromise that allows more time for studies and more playing opportunities. “I think we should outlaw redshirting except for medical reasons,” Stricklin said, “and I think we should give everyone five years of eligibility.” Stricklin reasons that regular members of the student body are taking longer to graduate, and college sports haven’t adjusted. Coaches have been requesting five years to play five—instead of the current five to play four—for years. So, why not let them play and still give them the extra year? These and other issues will be raised as athletic directors and conference leaders discuss the Year of Readiness in the next few months. The Thought Leaders may shoot down freshman ineligibility, but may generate better ideas to help athletes become better students. That’s why this is a great conversation to have, no matter the motive behind it. Vince Vaughn has a new movie coming out Friday. Here are his top five characters, all of whom could have been named Vince Vaughn. *Don’t remember The Fourth Man? It was a “CBS Schoolbreak Special” that premiered in 1990. Basically, Ralphie from A Christmas Story starts using steroids so he can be more like Vaughn’s character and win the approval of his father. There is a Ralphie-on-Trent roid rage scene. The original doesn’t seem to exist online, but Peter Billingsley and Vaughn were kind enough to recreate it on stage. 1. Spring practice is underway on multiple campuses. 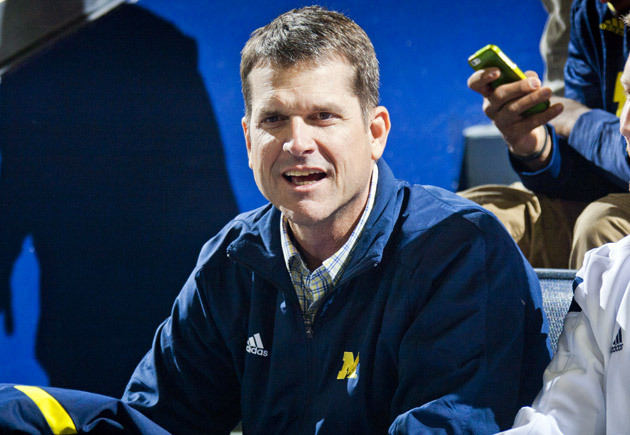 In an interview last week new Michigan coach Jim Harbaugh compared the first practice of a new year to emerging from the womb. Harbaugh was apparently using stock womb material, but the analogy is fitting—assuming Harbaugh referred to former blue-chip defensive backs doing backflips out of said womb. Jabrill Peppers was clearly excited, but was he as excited as Wolverines teammate Blake Countess? 2. Mississippi State’s Dan Mullen became the seventh SEC West coach to make more than $4 million a year when his new contract was announced this week. Now that the set is complete, some lucky school is guaranteed to pay a coach at least $4 million to finish dead last in the division. “We are all insane,” an official at an SEC school told me last week. Mullen’s raise reminded me of a conversation from 2013. Spencer Hall of SB Nation was a guest on the Black Heart Gold Pants podcast, and Hall and the hosts were trying to determine just how well Kirk Ferentz could live in Iowa City on his $3.5 million salary. Could he build a castle? Sure. Put a moat around it? Absolutely. Hire a team of knights to punt anyone unhappy about the lack of division titles? Of course. Now let’s try to imagine how well one could live on Mullen’s $4.275 million salary in Starkville. He could buy 777,272 large pulled pork sandwiches from Petty’s BBQ, 475,000 catfish blue plates from Restaurant Tyler or 305,575 pounds of blueberry cobbler coffee from Strange Brew Coffeehouse. But enough about how I’d spend the money. Mullen could build a house visible from space. In a few years, he probably would have enough cash to buy a large chunk of the town. He could rule Starkville like Brad Wesley ruled Jasper in Road House—complete with his own team of henchmen rolling around town in a monster truck. But that seems fraught with danger and falling polar bears. So maybe Mullen will simply diversify and buy some beachfront property and T-bills. 3. Defensive coordinator John Chavis filed a suit this week against former employer LSU and current employer Texas A&M to get out of paying the $400,000 buyout LSU claims Chavis owes. Why would he also name Texas A&M in the suit? Chavis contends he gave LSU 30 days notice—as required by his contract—which should eliminate the buyout. This is why even though everyone knew the Aggies had agreed to terms with Chavis in January, his hiring wasn’t announced until Feb. 13. Chavis contends his final day at LSU was Feb. 4. As assistant coaching salaries soar, these disputes will become more common unless schools simply accept the fact that they’re going to have to pay buyouts to poach top assistants. Oklahoma State and former offensive line coach Joe Wickline remain in a legal fight over the $593,000 buyout Cowboys officials claim Wickline owes after he left for Texas. Wickline contends he doesn’t owe a buyout because Texas hired him as a co-offensive coordinator with play-calling duties. But since Shawn Watson calls the plays for Texas, Oklahoma State AD Mike Holder wants his money. It’s likely that both of these cases get settled with some money changing hands. It’s also likely the assistant coaching market becomes more like the head-coaching market. Schools will just have to start assuming they owe a buyout when they try to hire sought-after assistants. 4. Speaking of lawyers and the Aggies, Kevin Sumlin might want to start asking recruits whether they’ve already retained a trademark attorney. Johnny Manziel trademarked “Johnny Football” while he was in school. Last year quarterback Kenny Hill’s parents filed to trademark “Kenny Trill” before their son lost his starting job and eventually transferred. Besides, Georgia already did the “We Run This State” thing. For a while, the official Georgia football Twitter feed was @WeRunThisState. That has since been dropped for the simpler @FootballUGA. It’s hard to claim that one runs a state when one can’t beat Georgia Tech at home. In the case of Texas A&M, the claim would have been a bit easier to make since the Aggies don’t have to defend the claim each season against Texas, Baylor, TCU or Texas Tech. 5. TCU quarterback Trevone Boykin will have surgery this spring to repair a broken bone in his left (non-throwing) wrist, Horned Frogs coach Patterson told reporters last week. Boykin will participate in most of the team’s spring practices before undergoing surgery in the final week of spring drills. The procedure will repair an injury that Boykin played through at the end of last season, and Patterson told reporters that Boykin should be 100 percent in time for preseason camp. 6. Even though Clemson officials installed a protective case around Howard’s Rock after a vandalism incident in 2013, it remains a target. Last week a man vandalized the case but failed to do any damage to the rock. He was caught on video, but remains at large. 7. SMU coach Chad Morris revealed a new helmet design last week, and it might be the most ’Murica helmet design in ’Murica. Whether the members of the Power Five conferences realize BYU intends to join one of them in the near future is another question. At this point, the Big 12 seems like the only Power Five league that might take more members, but it’s still tough to see how the finances would work out to ensure the current members of the Big 12 don’t lose money by adding schools. That would seem a logical requirement for the 10 existing members. Also, don’t expect the Big 12 schools to entertain any thoughts of expansion until after their request for conference championship game deregulation works its way through the NCAA legislative process. If the Big 12 has the option to stage a football title game with 10 members, then expansion would make even less sense. But we love talking about realignment. So keep making bold statements, ADs. It gives us something to discuss during the long offseason. 9. A pair of llamas captivated the nation for about 15 minutes last week. Then a photo of a white-and-gold dress—I’m not arguing about this, you blue-and-black psychos—usurped them. But YouTube user Kevin Ives put one more second on the llamas’ fame clock when he synced the video of their romp through Sun City, Ariz., with the audio from Auburn’s Kick-Six win over Alabama in 2013. 10. First, a Big Ten school wins the national title. Now, the Big Ten exports its weather to SEC country. I, for one, welcome our new Midwestern overlords. Research for this week’s random ranking took a solid 10 minutes, which is nine more than I’d like to spend on it. This was due to a shocking dearth of afterschool special clips on YouTube. I know some of you must have boxes of VHS (or Betamax) tapes loaded with valuable life lessons. Get uploading. In the meantime, enjoy two and a half minutes of The Boy Who Drank Too Much, starring Scott Baio. Don’t enter the Chuckbox line without an order in mind. Hesitation when that spatula is pointed at you could foul up a precision operation that hinges on quick ordering and what appears to be a semaphore system of toothpicks that denote exactly what the diner has ordered. And those who order correctly will reap a reward. Because the men who hold those spatulas are masters of a charcoal grill that puts all backyard cookouts to shame. 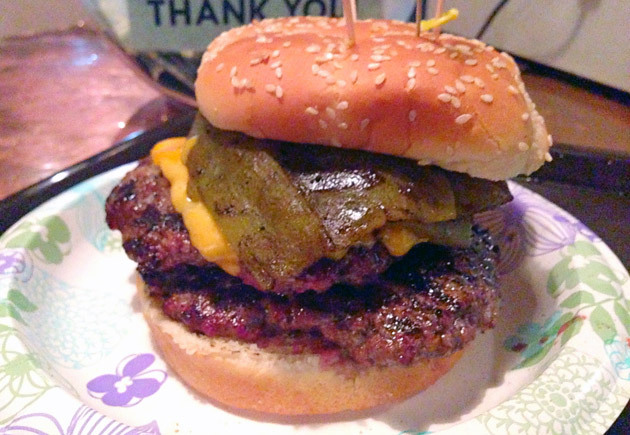 I ordered a Double Great Big One (two half-pound patties) with bacon, cheddar, and green chiles. (“Now that's a burger,” one of the frat dudes ahead of me proclaimed after I ordered.) All of this was cooked on the grill, and none was placed there until I ordered it. As my burger’s bun toasted, it was impaled with a long, broken toothpick, a long intact toothpick, a short toothpick and a green toothpick with a curlicue at the end. This code ensured the accuracy of my order. With about a dozen people in the line and at least six orders on the grill, the cook’s organizational skills were spectacular. The toothpicks truly spoke to him. When my creation reached the appropriate temperature, he slid it between the buns and slapped it on a paper plate. I paid, added mustard, ketchup and lettuce at the topping bar and took my seat. Then I took the first bite. Juice gushed in every direction when teeth met beef. The chiles provided the ideal spice to the flood of savory bursting from the patties. I had to flip the burger to set it down lest the thinner lower bun get drowned. (Nothing ruins a burger faster than a soggy bun.) I didn’t have to worry, though. Though I wanted to savor the taste, I couldn’t stop taking more bites. Before I knew it, the best backyard burger I’d ever eaten indoors was only a memory.